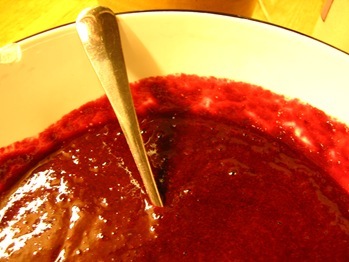 What you end up with is a perfect puree that is sensational stirred through thick Greek yoghurt to make a fool, or dolloped into a crumble mixture. My mate C said she’d put it on her porridge. Check the colour – it’s so rich and vivid! Definitely don’t wear your best pastel slacks or shirt when making or eating this. 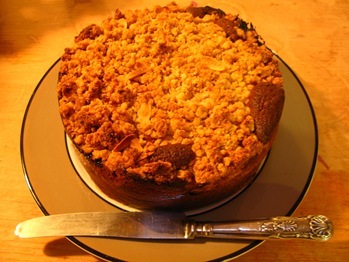 One afternoon, I thought I’d make the St John’s Rhubarb Crumble Cake, but use damsons instead. It was a very relaxing process, and the ensuing cake made a lot of people smile. 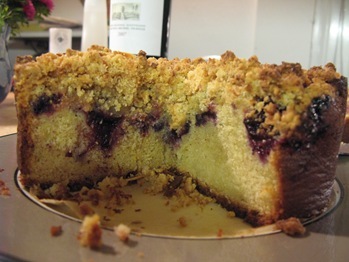 I mean, who wouldn’t smile at a cake with a crunchy crumble topping and a hidden fruit centre? Pure brilliant-ness. First stone the damsons. It’s fiddly but essential. Mix them with the sugars and orange zest and set aside in a bowl for 30 minutes. For the cake mix, cream the butter and sugar together until light and fluffy. Gradually add the beaten eggs, bit by bit to prevent curdling. Then fold in the sifted flour and last of all mix in the milk. Put to one side. 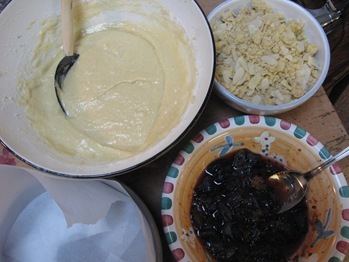 For the crumble mix, put the flour and butter into a food processor, blitz until everything resembles large breadcrumbs, then briefly mix in the ground almonds, sugar and flaked almonds. 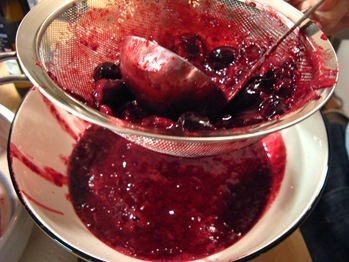 Sprinkle the crumble mix over the damsons. Place in an oven preheated to 180C and bake for about 1 1/2 hours, covering the top loosely with foil if it gets too dark. The cake is ready when a skewer inserted in the centre comes out clean. 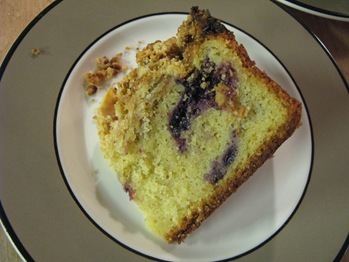 Note: don’t mistake the cooked gooey Damsons for uncooked cake mixture – I nearly overdid this cake because I thought it hadn’t baked all the way through. 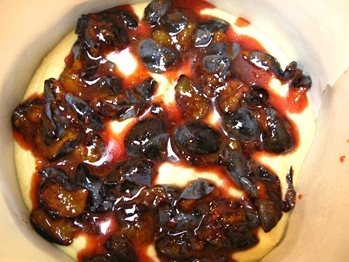 Serve warm, with custard or extra thick Jersey cream. I ate three slices of this cake in quick succession. Easy for a greedy mare! This looks great. I had so many damsons I didn't know what to do with this year. I'm putting this idea aside to have a go at with next years crop. I just did Jam http://jamtartsandgingerbreadmen.blogspot.com/2010/09/damson-jam.html which was lovely, but like you said a bit boring. 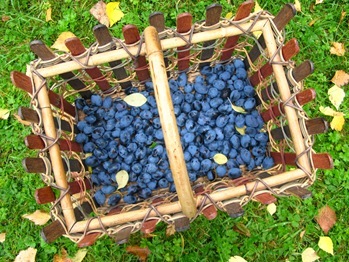 Hey Samantha, I loved your phrase about the damson tree 'taunting you' from the bottom of the garden – and how nice that you let people come and pick them for free!